I'm thinking that the publication of this facsimile was made possible by the folks who actually did the photography--the CSNTM. I thought this minuscule was from the 13th century, not the 10th? Oops, I see you mentioned it further in the post: "As usual there is the infected issue of dating. The Kurzgefasste Liste indicates 13th century, whereas the Albanian scholars dates the codex to the 10th century." In looking at the images, the handwriting sure does look later than the tenth century minuscules that I have collated. Daniel, good point. I assume they must have used the CSNTM photos. Darrell, in general, the dating issue can be tricky because a later scribe may use an archaic script. Then there are other factors. Owners often desire their MSS to be as ancient as possible and therefore more important and valuable. There are so many examples of this tendency that I have lost count. We see this particular manuscript Codex 93 or GA 2902 at CSPMT as 10th century due to proximity and strength of its readings as a "core" member of family Π subgroup (a). It is a therefore a member of the important older and most weakened of the Byzantine text forms quite similar to uncials Π (041) and K (017). So, we agree with the Albanians on the dating issue. Other Byzantine MSS of the same textual grouping would be GA 114, 389, 489, 1079 and 1219 among many others. If you have any further questions on this manuscripts textual grouping please contact us at info@cspmt.org. Thanks Paul. So has 2902 been collated then? I guess what had caught my eye was the zeta and xi which looked later to me than 10th century. We have collated it sufficiently to determine its precise Byzantine text form. It is closest textually to GA 1079 and GA 114 (both core Πa), the latter being also very similar in script to GA 2902. So, we hold that GA 114 as X cent. as well. The overall textual profile and iconography lean us to 10th cent. for both. Apologies, that was my last comment. Also, the Byzantine group types are not that difficult to categorize unless they fall into one of the main Kappa groups and outside of Kr/fam. 35. Then you may have some more difficulty and time to categorize each manuscript and full collation may be necessary. For the most part, CBGM or Claremont Profile Methodology still works quickest for the Byzantines and is generally accurate. I would recommend downloading both the McReynolds and Omanson thesis studies from our website to familiarize yourself on the types and quick keys for Byzantine manuscript group identification. Correction. That was meant as (CPM) Claremont Profile Methodology not (CBGM) Coherence Based Genealogical Methodology which INTF is now utilizing for the ECM. I do not understand how a proximity with other Byzantine MSS can affect the dating of the manuscript (containing the text). A common feature or characteristic within the fam. Π subgroup (a) manuscripts is only the earliest i.e. 10th cent. MSS contain most diagnostic group "core" readings of the group. After that, the group is compromised to Kappa second hand readings. This is not unique to Byzantine groups but it is an internal factor important to the dating of the individual MSS within this particular group. Also, the iconography plays a part as well and taken as a combination of factors we agree with the Albanians on the earlier dating of this manuscript. INTF had an expert iconographer come and the iconography was also confirmed dated to the 10th cent. Hope this is helpful to your question. I guess the scenario that I would wonder about is a monk in the 13th century who is cleaning out old stuff from the library store room and finds a 10th century manuscript in there, so he concludes that it would be great to copy it, so he sits down and makes a copy, even mimicking the 10th century handwriting style. This would not make his copy a 10th century copy, even though it would have direct proximity to the 10th century exemplar. Well, possible. But, if the monk did do that in Constantinople in this case in the 13th cent. he more likely would not have taken an exemplar of Π subgroup (a) but a Kx or another Kappa type MS in general use at that later time as this grouping was at its wane by the 13th cent. The likelihood we see is more on the side of it in fact of it being a 10th cent. manuscript as the Albanian Sate Archive holds as well as its similar paleographical and textual characteristics to other 10th cent. Π(a) MSS of that earlier period. Paul, the text has little to do with the date of the physical container, except the text cannot be later. The online Liste maintained by the INTF has not been changed as to the date of this MS (yet). Tommy, I think you are slightly too dogmatic in your statement that the form of the text and its date can only have a terminus post quem relationship. You are ignoring Paul's argument that most other manuscripts with this particular profile come from a certain time frame, and therefore, it seems to me, it stands to reason to assume that a manuscript with this same profile comes from the same stable. What you are defending is that the form of a text does not necessarily has a bearing on the dating, and I can't see anyone disagreeing with that in principle. Note that we are talking Byzantine manuscripts here, with lots of near-siblings around. As I relayed in my email to you. I am simply giving the internal textual argumentation based upon the facts of Byzantine group Πa for the earlier dating of GA 2902 without even factoring the external container arguments. Also, as you may know INTF is re-evaluating their dating scheme for the Liste for both new and for previously registered manuscripts. I was just relaying the information on what the expert opinion was at INTF on the iconography as a separate side note. Paul, I am simply saying that for me the text of a certain Byzantine MS is not so helpful when it comes to dating the manuscript, regardless of whether its text is akin to the oldest Byzantine MSS. Dirk, I wish not to be dogmatic, but I think the argument from text should be used with great caution, and in this case I don't think it can be used at all (to decide whether a certain Byz MS is 10th or 13th cent.) – it may in fact be directly misleading! I will take an example, the MS 1219 (11th century) is considered to be a core member of Πa by F. Wisse. MS 489, which has a very similar text (they form a pair), has a colophon giving the date 1316. I am sure there are many other examples. Iconography is a totally different matter. As for palaeography, I think many dates in the Liste will have to be revised up and down, perhaps mostly up when it comes to Byzantine MSS? Really? It would surprise me if many dates have to be revised. After all we have so many dated manuscripts from 1000-1500 from every decade, sometimes practically every year. I would have thought the development of hands was pretty well trackable. Anyway, no time for this. Today is the SBL deadline day. Got to write some papers. Pete, I am thinking specifically of the pearl script. There was in the Palaeologan period (1258-1453) a revival of the 11th century pearl script. See H. Hunger, "Archaisierende Minuskel und Gebrauchsschrift zur Blutezeit der Fettaugenmode: Der Schreiber des Cod. Vindob. Theol. gr. 303," in La paleographie grecque et byzantine, Colloques Internationaux du Centre National de la Recherche Scientifique, no. 559 (Paris, 1977), 283-90. A case in point is the atelier described by H. Buchthal and H. Belting, Patronage in Thirteenth-Century Constantinople: An Atelier of Late Byzantine Book Illuminationand Calligraphy (Washington,D.C.,1978), 4-5. Buchtal and Belting identified fifteen MSS coming from the same atelier. Some of them are dated way too early in the Liste. Some years ago I had a student write up a small essay on J. Paul Getty Museum, MS 65 which belongs to this group (we made sure by the time that it was registered by the INTF; it is Greg.-Aland 2894). In his essay, my student pointed out that Athos, Lavra A 2 (Greg.-Aland 1439) belongs to the same group. However, it is dated to the 11th century in the Liste. This ought to be changed. Another case is Biblioteca-Marciana gr. 541 (Gr.-Al. 355) which belongs to the group. It is dated to the 12th century which is also too early. fore the Palaiologan triumph of 1261" (p. 50). Incidentally, it would not surprise me if Maxwell is the iconographer that Anderson referred to. My own paper was turned in quite some time ago but many other things to do as well. But, for the sake of this particular manuscript at question which this topic is about I will summarize my case. Your example of GA 489 is exactly what what I am referring to. One of the later Π(a) MSS with dependence with GA 1219. Both are is weakened towards Kappa in many places and therefore are not as close to the type exemplar readings found in (041) Π . Not so with GA 114, GA 1079 which form an older cluster of not only older MSS than those mentioned but older readings as well. So, Tommy it is more deep than you are recognizing. I am still saying the text in this case weighs heavily for the age of this particular MS. Rather than get our readers bogged in more technical details of the two subgroup divisions I will leave it at that. I am not saying all cases are the same or like this particular one but we realize at CSPMT these issues are especially important concerning the age of GA 2902. Again, the above stated without mention of iconography. Paul, I am sorry that I cannot agree with you on the methodology here. The point is that I think a late manuscript can potentially be copied from a manuscript with a much older text. I think, thus, that the text criterion is deceptive when it comes to dating. Moving outside of the Byzantine text, a manuscript like 614 (13th cent.) is very valuable because it attests to an early stage of the "Western" text. There are many other examples. By the way, I browsed Wisse again and found that other "core members" of Πa are 581 (14th cent.) and 2404 (13th cent.). A momentary breather gives me a moment to respond to you. Dirk was right, this could be a separate blog filled with technicalities. Question, which methodology are you implying I am using here in this specific case? I am referring to specifically an early cluster within Πa. It appears Tommy you are implying I have some sort of early date agenda here at stake for the Byzantines in general. Nothing can be farther from the truth. Quite the opposite. I am focusing on GA 2902 and the early cluster within core Πa which it is a part of and is quite limited in number. So, agree and disagreement again. Yes, Wisse is right "core" members in the case of GA 581 and 2404 but they both contain a degree of Kappa intrusion of core Πa readings which this cluster in question does not. They are definitely not of the core strength as in the case of for example GA 114, 1079 and in this case 2902. So, in the end Tommy an older internal cluster once again exists you are not seeing. These are all earlier MSS with similar script and pre-Pearl style script you mention. Also, the subject of the imitation period or Hodegon script style is an interesting case in point too. The vast majority of Hodegon script style (Palaeologan period (1258-1453) are Kr/fam. 35. Exceptions to each trend are evident but the general trend is as stated. In conclusion, I stand by the cluster in subgroup (a) in Π as predating all others you mention including GA 1219. If exemplar copying was done after it there would of necessity contained more Kappa intrusion which GA 2902 does not contain. There are reasons for this I could get into but won't at this time. Also, on the iconographer specialist they brought in I don't believe you are correct though you would have to ask Klaus or Ulrich. PA: "which methodology are you implying I am using here" ... "you are implying I have some sort of early date agenda here at stake for the Byzantines in general." No, not at all. You thoroughly misunderstand me. I thought I made plain that my very simple methodological point is that you cannot use *the text* of a Byzantine MS to decide whether it belongs to the 10th or 13th century. We can talk endlessly about core members, clusters and subgroups of the Πa but that is beside the point I am here making, which also has nothing to do with any agendas. Now, when you begin talking about script and iconography, that is another thing altogether. These factors are crucial for the dating issue. To sum up the simple principle: similarity of text still allows for dissimilarity of dates. Dirk pointed out that one must not be too dogmatic, but I fail to see this in the case we are here discussing. Has anyone compared the script of this MS to the Covel Gospels (which has a cruciform page)? Jeffrey Anderson wrote a very detailed book about a cruciform lectionary (Pierpont Morgan MS. 692) from the 1100's; he even analyzed its ruling-patterns, and some of its illustrations, iirc. Perhaps someone should ask his opinion of the date of 2902. Thank you for the interest that you are showing on this publication. I see that there are some questions here without an answer. I will try to answer shortly. 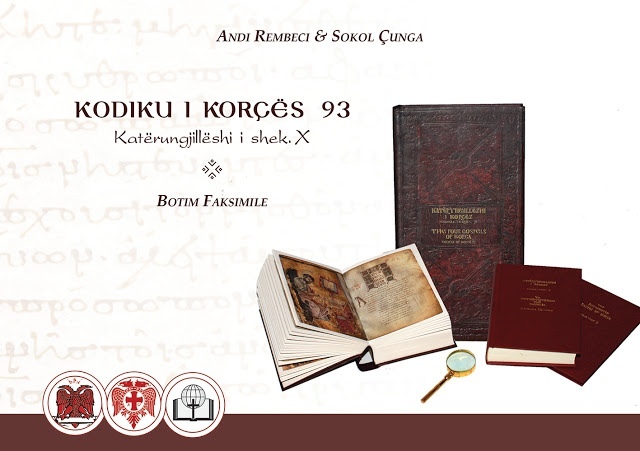 First, the publication was done by the Interconfessional Bible Society of Albania, with the collaboration of the General Directorate of the Archives of Albania (the institution responsible for the Central State Archive, where the mss is housed) and the Orthodox Autocephalous Church of Albania, as the institution that housed the mss, before it was part of the CSA collection. It was printed in Athens by the MILITOS Editions. MILITOS also did the pictures. No CSNTM images were used, except for study purposes. According to us, my colleague Andi Rembeci and myself, the mss should be dated on the 10th century for several reasons, the crucial of them being the writing, since there is no colophon. The writing is a classic bouletee, usual for the fist half of the 10th century (for this see Irigoin and Agati on minuscule buletee). While the decoration of the mss has been dated from A. Dzourova ((Manuscrits grecs enluminés des Archives Nationales de Tirana (Vie-XIVe siècles), Études Choisies, vol. I-Texte, Sofia 2011, pp. 73-97)) on the "two first decades of the 10th century" (sic). The difference between us and Dzourova is that, while she suggests that the miniatures date also on the 10th century, to our opinion they date in the 13th century. Here comes the connection of the book with the 13th century, but not of the text. Also, together with the four miniatures, the hypotheses of the Gospels, a Synaxarion and a Menologion have been added, supposedly while rebinding the mss. The new binder gave also a new (mistaken) numbering to the quires of the mss (as it can be seen here: http://images.csntm.org/Manuscripts/noGA_Minuscule_Tirana_ANA_93/noGA_Minuscule_Tirana_ANA_93_0231b.jpg). If it could be of any help in this issue, there is a note at the last folio of the main part of the mss, written on year 6690 (=1182), saying that Louke of Skinures (Λουκάς του Σκινούρη) from the holy monastery of Perivleptos (Περιβλέπτου) bought this book of the Four Gospels with the price of 21 hyperpyra. No doubt that this handwriting dates at the end of the 12th century. As for the family of the text, we take no position, since that is a mastery that we don't have. Our observations are based, as I mentined above, on paleographic, codicologic and history of art points of view. paleographer and archivist at the Central State Archive of Tirana-Albania (coo-author of the facsimile publication of GA 2902.
thank you very much for your valuable comments which further illuminates matters. Yes, as I said, I am not at all opposed to a dating of this codex to the 10th century. I only made an objection against the appeal to the textual character (not speaking of the script) in general. I take the opportunity to congratulate you for this splendid achievement. I only wish I could purchase a copy myself (but I don't know how). It would be excellent for teaching purposes. The Interconfessional Bible Society of Albania is building a web page dedicated to this publication. I hope it will be ready soon. All the necessary information about purchasing a copy will be given there. For the time being, you could write to Mr. Altin Hysi at: altin@biblesocieties.org, who is the General Secretary of the IBSA. Thank you very much! Today I have had the chance to peruse the companion volume to the facsimile which was brought to me by a colleague, affiliated to the United Bible Societies, who had received the publication. It was very nice to read. Thank you also for referring to my work at one point (on Papyrus 72). It was appropriate to mention your work on the introduction. Any criticism or objection that you might have related to our work will be welcomed by Mr. Rembeci and me.